The Heritage Collection of Pride Lift Chairs offer style and durability that will last for years to come. Quite operation, superb comfort, and reliable performance, are standard features on these lift chairs from Pride Mobility. 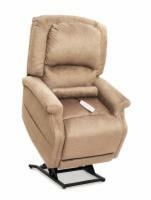 Want to know how you can save up to 40% on your next lift chair recliner? Contact our lift chair professionals 7 days a week at 1-800-791-6814.